1. I received a letter dated the 2nd of november stating an acknowledgement of receipt of my defence (which was sent on the 30th of october) from the HM courts and tribal service. 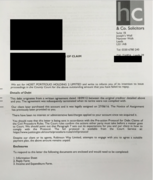 It states that "a copy is being served on the claimant (or claimants solicitor) and the claimant will inform the court of he wishes to proceed, and the court will inform me of what will happen. If they wish to proceed they must contact the court 28 days after receiving a copy of my defence. after that period has elapsed the claim will be stayed. the only action the claimant can then take will be to apply to a judge for an order lifting the stay"
what does this mean, as it is now the 5th of december and i have heard nothing. i left it 28 days plus 5 days (which is what was detailed on a previous correspondence in relation to getting back to them) and want to respond to them accordingly. as ever any advice is gratefully received. 1. It looks good,you could of course try asking the court ( although I found recently that they do not appear to answer the phones anymore,& emails take about 15 days to answered) that was my experience anyway. Best wait for tiggy for the best response . 2. The new letters are in the debt section (New letter process) & the old ones are there also in the debt section ,take your pick. If they fail to indicate that they want to proceed, then after 33 days the claim is Stayed (halted), they can apply at any point for the stay to be lifted and for proceedings to continue. There is no limit to the amount of time a claim can be Stayed at Court. Have you sent either a CPR 18 (under £10k) or CPR31.14 request for over £10k claims? If you have make sure it's been sent to the Court and you ask for it to be placed on the Court File. After that it's a waiting game. I have been playing the waiting game so to speak and i have received a letter yesterday from Dryxdens. This is the first correspondence since November when they acknowledged receipt of my defence. It seems a bit weird as they are sending all documentation that I have previously received from them. Im not sure how this is going to pan out but from my perspective i obviously don't want it to too to court so want to put in the correct reply and response. any ideas on how to move this forward would be gratefully received. Any ideas or advice would be most gratefully received. I am getting some earache on this and need to know what my next move should be. It really depends on what they've included and whether they've included the main document, which is the agreement. If you don't want it to go to a final hearing and risk a CCJ, then you have the option to mediate and offer a settlement (called a Tomlin Order). If you do make an offer you have to stick to it as a Tomlin Order only stays (halts) proceedings and they can be restarted if you fail to keep to the agreement. On the agreement and any other correspondence there are no signatures. There is a box that has been ticked which says "signature of customer" and a "date of signature"
This card was taken out in 2013 hence why I am asking about the possible scenarios to settle as I gather tings changed after a certain date. Is this correct and what is the situation in how the land lies? Any help here would be fantastic as I want to put this to bed as soon as I can and work out what my next move should be. Any advice would be fantastic. OK, well since Carey vs HSBC they can produce what's known as a reconstituted agreement, which has to be a True Copy of the agreement but not necessarily the actual copy of what you signed. If it is a true copy (ie has all the correct prescribed terms etc etc) then by experience once they produce the agreement then it doesn't tend to go your way in Court - IF they actually turn up on the day - they don't always, so that would be a bit of a gamble. If you're happy to do so and you really want to avoid the possibility of a CCJ, you might want to think about taking it to a final hearing date to see if they discontinue, then turning up at the hearing and if they have sent a representative then making an offer to settle on the day. Alternatively, if you really want to put this to bed ASAP then either go to mediation (it's actually a telephone call) and make an offer to settle or direct to the claimants, it's your call. in relation to the mediation, how does that work then? Do i deal with the solicitors or deal directly with the original owner? Also is there any guidance in relation to a decent offer for settling as the last thing i want is a CCJ in all of this. Should I fill in the finance form that they have asked me or just pick up the phone and say "lets come to an arrangement?" When you submitted your defence you will have ticked the mediation box option, presuming the claimant has done the same then as far as I am aware the court should be in touch to arrange a mediation call. The call last about an hour so have everything prepared. That said though, if you have not heard anything after a couple of weeks, then it may be worth being proactive and touching base with the court. As far as a any settlement would go, you just have to be reasonable, it is unlikely you will get it all your way and the same goes for the alleged creditor. I could be wrong but I don't think you need to fill in a statement of earnings prior to mediation taking place. Technically you can circumvent mediation entirely and go straight to the alleged creditor and make an offer of settlement, that said though, that would not be using the mediation service, which should it end up in court that would be what the judge would want to see e.g every attempt was made by both parties to settle the matter prior to hearing, the alleged creditor will not be forthcoming about any direct offers to settle made. At the moment I think this claim is Stayed as I don't think they indicated to the Court of their to proceed within 28 days, so they will now have to apply to the Court, pay the fee to lift the stay and proceed. If they do that the Court will then allocate it to a specific track but first they'll send out an allocation questionnaire, it's at that point you state your willingness to enter mediation. So for the moment I would do nothing, wait for them to apply to get the stay lifted, you never know the Judge may be so pissed off with these Companies that he denies the application, unlikely but as I say 'you never know'. Would i be right in saying that as they didn't reply within the 28+5 days after I sent my original defence back, then it is automatically stayed? If you can clarify that then, i will sit back and wait to see what happens i think. One question. In the letter from above which i received a couple of weeks ago with all the documentation, they state they will "apply for summary judgement against me without any further reference"
whats that all about then? @westcountryhelp wrote: thanks for the feedback. If the claim is stayed either the claimant can apply to have the stay lifted and the claim to proceed or you as defendant can apply to have the stay lifted and the claim dismissed. So they could make an application under part (ii), but you could then argue that the defence submitted showed that there were issues that were 'triable' and that their application should be dismissed. Received this in the post from a DCA who are threatening court action. This is one that has done the rounds when i have sent letters off in the past. Do you just start the 3 letters process with these again? And in reference to the court action with RBS I have recently received this as well. Does this mean that it is all going ahead and if so what is the next course of action to be taken? Do i just wait until the paperwork arrives? Or are there set parameters that have to be followed? As ever any advice would be most welcome. Might be a good idea to start a separate thread for this so as not to confuse it with the existing proceedings. 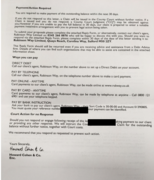 @westcountryhelp wrote: And in reference to the court action with RBS I have recently received this as well. Does this mean that it is all going ahead and if so what is the next course of action to be taken? Do i just wait until the paperwork arrives? Or are there set parameters that have to be followed? As ever any advice would be most welcome. Yes, it means it's going ahead. You should receive notice from your local court. Have you passed on everything you've asked for and any negative responses received to the Court, if not you should do that. does it make a difference that the court is really local to me? and when you say "pass everything i have asked for" what do you mean? Isn't it the Court you nominated? Sorry, not sure what you mean by 'does it make a difference that the court is really local to me'. The defendant in a claim always nominates the court where they went the case to be heard. Any information you've asked for (CPR 18 or 31.14) or copy of the agreement and any negative response you received from the claimant - you copy that to the Court and ask for it to be placed on the Court File. Hopefully, when a Judge comes to read the file and sees what you've asked for, will then issue directions that'll request the claimant provide what you've asked for and what they're unwilling or unable to supply. As far as I can remember I didn't ask for a court to be nominated. How would I find this out? And If I make a copy of anything negative they have sent me then file that to the court? BTW, I haven't been sent any confirmation of anything as yet, so I guess I will just wait and see what happens. One of my other ongoing issues (which has been around the houses with various DCA's etc) started the 3 letter process (as detailed in a few replies above) I have just checked the dates and they are over a month in getting back to me. Should I fire off letter 2? although in their response they said they would get back within 28 days. Were you not sent an allocation questionnaire to complete and return, that's where you normally nominate your local court. What exactly was said in the notification that it was being allocatec to your local court, I can't read what you've posted up - it's too small. Is there any way of checking this? Ok, that's not good - it's been transferred to your local Court as the claimant has applied for Summary Judgment under CPR24. So you need to start work on a Witness Statement in support of your argument against Summary Judgment ( ie there are issues which require a full hearing). That will have to be with the Court and served on the claimant 14 days before the hearing date - you'll also have to attend the hearing to argue your case. Have you not received a copy of their application?? I haven't received anything from them or the court since this letter arrived about a week or so ago. Should I receive the application before anything goes ahead? As I mentioned before this is the one i am most concerned about. It was mentioned about entering into a discussion with them to come to an arrangement to avoid a CCJ (it was called something specific). When is the time to do this if decide to go down that road? Now or when the paperwork arrives? And is there a specific timeline that will now take place?